I have a few Japanese books that I've been reading over a long period of time, but one day I thought, "I need something else". 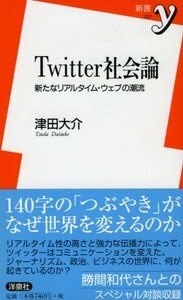 So I went to a Japanese book store and bought Twitter社会論 - 新たなリアルタイム・ウェブの潮流 [discussing the Twitter society - the new real time wave trend]. It's interesting to see how an instant communication tool is affecting an ancient culture. I'll probably have more to say about it as I work through the book. Why can't you understand me?